You all made me do it!!! You are all enablers!!! I have a serious case of "Cuttlebugitis"!!! Read here for more information and you will see why you should RUN, not walk, to Michael's this week and purchase this little green wonder!!! There is a coupon in this weeks paper once again and it does not have an exclusion on it! 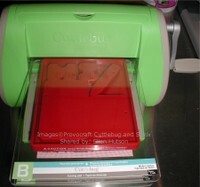 You may have to talk to the manager, being that I had to "discuss" at length that the Cuttlebug is an entirely different product than the Cricut. There is a sticker on the Cuttlebug box that says it is made by the same manufacturer as the Cricut and they are trying to tell us that due to this reason we can not use the coupon. This is WRONG - do not leave the store without using your coupon to purchase it. They must honor this coupon and I do believe that if you are on the fence, jump over right now and use that coupon before the Cuttlebug is added to the exclusion clause. So... I have Cuttlebugitis BIG time! Julie made me want a "crank" style diecutter when she brought over her Big Shot, but I was patient - I waited and waited and waited... Well that is I waited until I saw the thread over at SCS and realized that the coupon from Michael's was burning a hole in my pocket. I realized that if I didn't run to the store right away they might be out, or they might start putting an exclusion clause on the coupon, or... Well I just had to have it! Yes girls - it is FABULOUS! I picked it up late yesterday afternoon and look what I cranked out in a matter of minutes this a.m.
Look closely at the pale chartreuse flowers. First, I used one of the Cuttlebug embossing folders on the Memory Box cardstock and then I cut it out using my Sizzix Paper Sculpting, Daisy. I can hardly wait to get more of the embossing folders. I love the fact that the Memory Box cardstock has a white core - when dry embossing like this you can then just take your Lucky Squirrel sander and remove the color from the surface with ease, getting a beautiful contrast with the paper below. Hopefully, I'll have a chance to put these little goodies into a card form over the next couple of days. 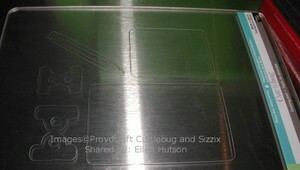 Here is a comparison of the footprint to my "OLD" Sizzix - I say old because I don't know that I'll ever use it again. Craft garage sale here it comes! The Cuttlebug takes up FAR LESS room. Even when open it only uses about the same space as the Sizzix "did" (teehee - I've already removed it Ü). The suction is incredible! Even when cranking the chipboard through, it stayed securely in place. I do believe it is important to have a clean smooth surface on which to attach it, but it holds PERFECTLY! Yippie skippie! It takes the Sizzix dies! I measured the bed and a 6x6 piece of paper needs to have about 1/16" trimmed off the edge to fit through properly. After I took this picture I realized that I could fit these dies in "sideways" and they would still fit perfectly - so the tray is a wonderful width! When you crank your dies through the machine you will hear some snap, crackle and popping - but it's all OK. Just keep crankin'. I had to take a picture of my cutting pad just to memorialize that virgin cut (and share the effects that you should not be concerned about). Replacement cutting pads are not expensive and I do believe that these will last for quit some time. My adventure with the Sizzlets hasn't been perfect, but I know I'll get there. The directions that come with it do NOT work with the Sizzlets. I think they must work with the Quickcutz, but being that I don't have any of these I can't tell you. The depth of the Sizzlet is to thick to use with the optional C cutting board. So I tried it with the B cutting board and as you can see it did not cut out all my letters. Then I tried inserting an additional piece of cardstock - it still did not cut out the detailed letters. Finally, I tried inserting a thin piece of chipboard - this did work, but I can't recommend it being that I had to crank so hard I was wondering if I was going to snap my handle off. I had to finish it, because I had started and was in the middle. But believe me, I was holding my breath while trying this. I do believe that this will work beautifully as well, once I get the correct size determined to add as my additional layer. I'm just not quite there yet. That's all I have time for right now. I hope you find this helpful and if you have any hints, suggestions or products you have tried your Cuttlebug on I would so appreciate and love it if you would post your comments below!!! How do u get the CB to cut felt? I have a tonne of felt sitting at home. I tried it ages ago but the dies didnt cut thru cleanly...did i do anything wrong? 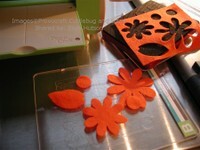 I am interested in finding some sort of machine to use my fiskars embossing plates with. I see that the cuttlebug might be that option. Have you used these plates on this machine and does it work ? THANK you for your anticipated response. Thank YOU for all your information on the cuttlebug and other information.. I also have the Fiskar Plates. I did what you said about putting it in my CBug. It worked but I sure was praying that I wouldn't brake my Bug.. Should it be this hard to put through.. 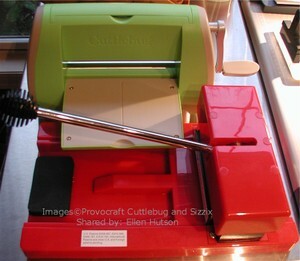 Thanks for all the great information about the Cuttlebug machine...I've just bought one & need all the help I can get. Love the card that was made with the Roses and Daisy's stamp. The vellum was dry embossed using a Fiskar's texture plate in the Cuttlebug. Can you tell me the name of the texture plate? I have been searching in vain for it! I just opened up my Cuttlebug for Christmas and was wondering if you ever got your Sizzlits to work. I can't get mine to go through following their directions--do I just use the B plates, the A plate, and add some cardstock/chipboard? Omigosh! This is so timely! I just got the "bug" yesterday. I love your pics and the experiments you did. It is so appreciated! Keep up the good work! OMGoodness Ellen! I have read all of your product reviews and I have a feeling I'm gonna be spending some serious money very soon! LOL! Thanks for being so thorough! Thanks for sharing your information. I only have one embossing folder, and no other machines, but I am trying to get all the information on the 'bug that I can. I am liking it so much, and liked the sanded look. Wow, thanks for sharing all of this info. Your pictures are wonderful! I just got my 'Bug a couple days ago and was really hoping the Sizzlets would work with it. There must be some combo that would be workable. I noticed you have the Sizzlets dies facing down. I wonder if it makes a difference if they face up, like the Cuttlebug's dies are supposed to? Just a thought.